We took an amazing tour of an imperial citadel with a 1,300+ year history. It was built when the Vietnamese first established a capital in Hanoi. The French destroyed many of the ancient structures and then built colonial villas on the ruins, which the Vietnamese army took over and used as their headquarters during the Vietnam-American war. The Vietnamese built an underground bunker for their top military leaders beneath one of the villas; the bunker could withstand air attacks, and you can now visit it and see where they sat and made decisions that affected the course of world history. What does that have to do with the thermos in this picture? Thanks for asking. 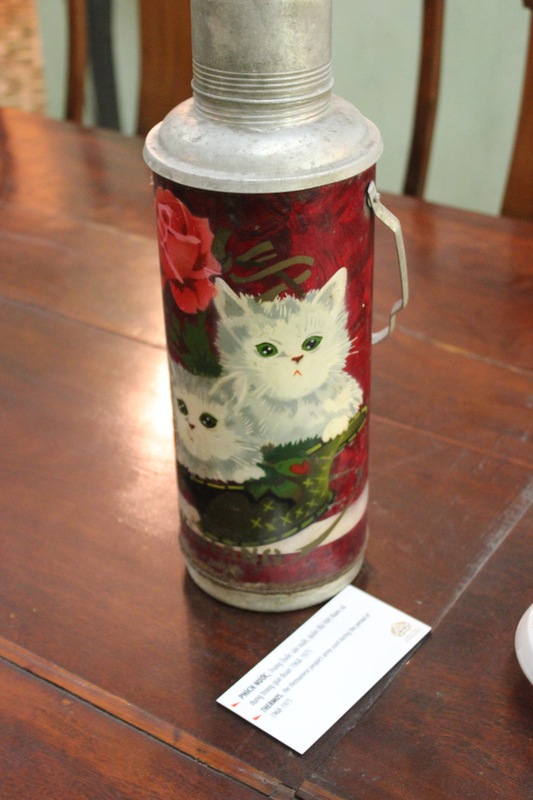 WHILE AMERICAN BOMBS FELL ALL AROUND THEM, THE HIGHEST RANKING COMRADES IN THE VIETNAMESE GOVERNMENT DRANK COFFEE FROM THIS KITTEN THERMOS DURING THEIR TOP SECRET MEETINGS IN THEIR UNDERGROUND BUNKER. Which, in my opinion, is simultaneously ridiculously adorable and incredibly badass.